with external dynamometric cell for measuring traction and compression. The PCE-SH 200K force meter operates with the help of a dynamometric cell. The PCE-SH 200K force meter (also known as force cell) measures the force applied to the sensor. Traction and compression forces can be usually measured by an elastic deformation. 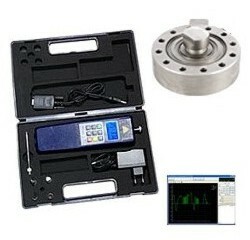 Force meter is used to measure force as well as to weigh and determine the torque moment. The 5 m connection cable allows the installation of a load cell, i.e. a machine or installation or to adapt the cell to a test position. 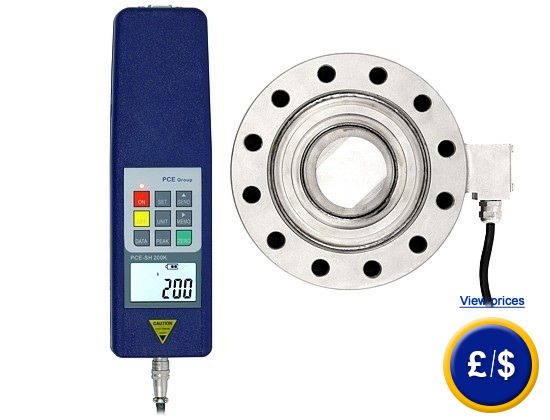 The PCE-SH 200K force meter is highlighted by both its high resolution and its high measurement range up to 200 kN. 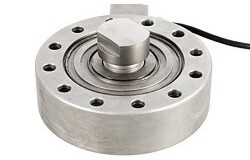 This allows to easily and accurately measure traction force in a press or hydraulic traction force. The PCE-SH 200 K force meter does not need any additional cell due to the integrated cell that measures traction and compression forces up to 200 kN. Here you will find other force meters with the same properties but with different dimensions and measurement ranges. - Overload protection up to 150%. The backlit display is easy to read, and aside from showing measurement results, it also displays battery level, average value, maximum value and the corresponding memory location. There is also an arrow to indicate the force direction. Above the display there are three LEDs that show if maximum limits are reached. The device will also beep to indicate that limits are exceeded. A zero reset can be performed when required using the PEAK button. The backlit display function can be turned on by pressing a button. The SET key allows maximum and overload limits to be programmed into the device. The dynamometric cell can be attached to a machine or installation (you will find a drawing with the details) using the clasps which come with the device. The clasps can be unscrewed and removed from both sides of the dynamometric cell in such a way that the cell can also be fastened to other elements such as a test position. 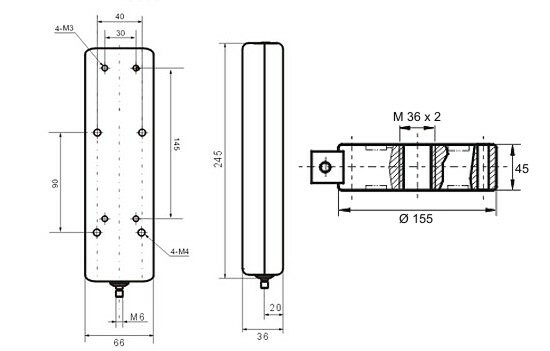 The screw hole (M36 x 2) is at both sides of the dynamometric cell and it is used to fasten claws and hooks, as well as to be attached to a test position. The real-time software can be used even without any previous knowledge of the program. The user can start and stop the measurement very easily when the PCE-SH 200K force meter is connected to a computer.